SocioPatterns is an interdisciplinary research collaboration formed in 2008 that adopts a data-driven methodology to study social dynamics and human activity. Since 2008, we have collected longitudinal data on the physical proximity and face-to-face contacts of individuals in numerous real-world environments, covering widely varying contexts across several countries: schools, museums, hospitals, etc. We use the data to study human behaviour and to develop agent-based models for the transmission of infectious diseases. We make most of the collected data freely available to the scientific community. Left: One of the sixty-nine daily diagrams of contact activity. Right: Thumbnail of the poster with the complete visualization and accompanying text. 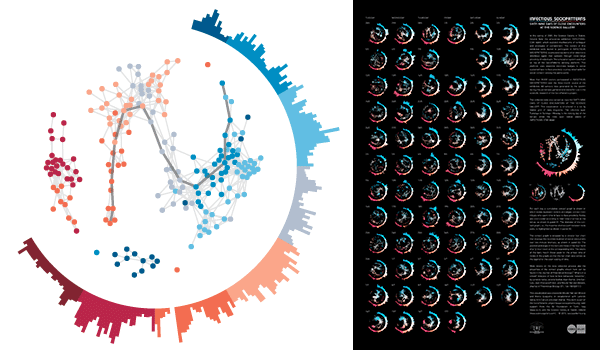 We have created a visualization of sixty-nine days of face-to-face contact activity among more that 30,000 persons based on data collected during the INFECTIOUS: STAY AWAY exhibition in the Science Gallery in Dublin, Ireland. This visualization is published in our gallery as a poster that can be freely downloaded. In order to fight and mitigate emerging epidemics, non-pharmaceutical interventions can become necessary. Among these, school closure is typically regarded as a viable mitigation strategy: children indeed are known to play an important role in the propagation of infectious diseases, due to their high rate of contacts at school. School closure is however a costly measure whose applicability remains uncertain and whose implementation should carefully be weighed on the basis of cost-benefit considerations. In two successive studies published in BMC Infectious Diseases, we have used high resolution data on the contact patterns of children that we collected in a primary school,(i) to define and investigate alternative, less costly mitigation measures such as the targeted and reactive closure of single classes whenever symptomatic children are detected, at the scale of a single school and (ii) to evaluate the effectiveness of several such gradual reactive school closure strategies at the scale of entire municipalities. 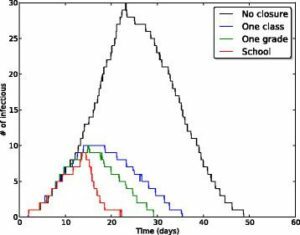 Our results highlight a potential beneficial effect of reactive gradual school closure policies in mitigating influenza spread. Moreover, the suggested strategies are solely based on routinely collected and easily accessible data (such as student absenteeism irrespective) and thus they appear to be applicable in real world situations.